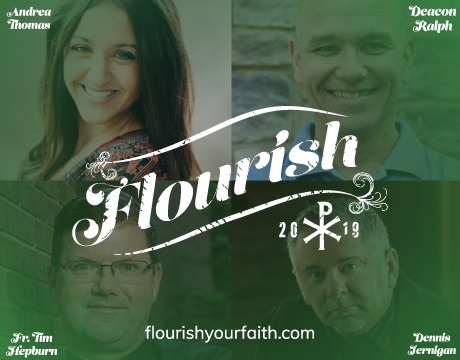 Flourish is a two-day conference for youth and adults designed to energize your faith and deepen your relationship with Jesus through the power of the Holy Spirit. Join us May 3rd and 4th in beautiful Fort Lauderdale, Florida. Come together with fellow believers, growing and learning through worship, prayer, fellowship, and talks by renowned speakers from across the country. Grounded in the primary goal of intimacy with Jesus, topics addressed include the dignity of human life, the sacredness of sexuality, and the freedom to live and declare what we believe. The Flourish Conference is for families (pre-teen and up) to come together, pray together, and learn together. We pray that participants will leave Flourish committed to responding to Jesus’ invitation to a life of intimacy Him and allowing His love to overflow into every area of their lives. For more information and to register, visit www.FlourishYourFaith.com! Luncheon - Sunday, May 5, 1:30 p.m. Enjoy delicious lunch and afternoon of fun and fellowship. Proceeds to benefit Educational Fund to award scholarships to children in the Inner City of Kingston, Jamaica. More information call Angela - 954-974-8453. St. John XXIII Knights of Columbus and the Youth Ministry invite all of our community, teens and their families, to a "Celebration for Mom, Dinner and Concert" on Friday, May 10, from 6-9 p.m. at St. John XXIII Church, 16800 Miramar Parkway, Miramar FL 33027. Donation: $5 per person. You can buy your tickets at the church office. 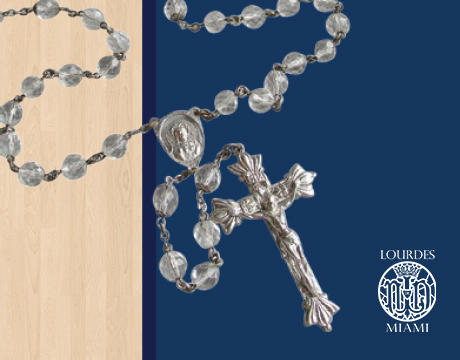 In honor of the Immaculate Conception, we will be having the Rosary Candlelight Procession at 8 p.m. Please join us for our Rosary Candlelight Procession. Everyone is invited, especially those who are sick and those who care for them. En honor a la Inmaculada Concepción, tendremos la Procesión del Rosario a las 8 p.m. Todos están invitados, especialmente los enfermos y los que cuidan de los enfermos. Come join The Social Active Adults (SAAM - anyone 21 and over, married or single) for an evening of fun, fellowship and a meal on the second Saturday of each month in Trinity Hall (behind Blessed Trinity Church), 4020 Curtiss Pkwy, Miami Springs, FL 33166! Spread the word! Bring a few friends! Bring a dish to serve 6-8 people and your favorite beverage. Remember, you may be the one someone new to SAAM needs to meet! The Social Active Adult Ministry - S.A.A.M. - at Blessed Trinity Catholic Church in Miami Springs, is a social group composed of active adults, single or married, church member or not, over the age of 21, interested in interacting with other adults. Participate in an evening of fun, fellowship and a meal on the second Saturday of each month in Trinity Hall (behind Blessed Trinity church), 4020 Curtiss Parkway, Miami Springs, FL 33166. Come as festive or as casual as you wish! Bring your friends! Spread the word! Although you may not personally need to meet new folks, you may be the one that someone new to S.A.A.M. needs to meet. Coming by yourself? Don't know anyone? Let us know when you make your reservation, we will warmly welcome you! R.S.V.P. no later than two days prior to the event. Make S.A.A.M. 's Second Saturday Social a New Year's resolution you can keep. Come join us, make new friends, enjoy fun activities and potluck dishes! Catholic Legal Services of the Archdiocese of Miami will present its annual New American Awards Gala, this year with the theme, "We Are Family," on Thursday, May 16, at The Rusty Pelican restaurant on Key Biscayne, beginning with cocktails at 6:30 p.m. and dinner at 7:30 p.m. The New American Awards recognize the outstanding contributions of individuals (families) with immigrant backgrounds who have significantly contributed to the community, to our country and to our identity as Americans. Sponsorship opportunities are available. For more information, go to http://www.newamericanawards.org/pdf/SPONSORSHIP_PACKAGE.pdf. The Annual Awards Gala is Catholic Legal Services' major fundraising event. Catholic Legal Services is a nationally recognized agency with an experienced team of attorneys and immigration professionals and whose mission is to provide professional legal services to those who come from foreign lands who lack sufficient means to obtain representation without regard to faith or national origin. With your ongoing support, we will continue to provide legal services to immigrants who cannot afford private counsel. These services include representation before the Immigration Court (IC), Board of Immigration Appeals (BIA), United States Citizenship and Immigration Services (USCIS), United States Immigration & Customs Enforcement (ICE) and Juvenile Court (JC). More than 2,000 individuals seek the services of CLS each month including immigrants seeking to reunite with their families, many of whom were separated at the border; political and religious refugees seeking safety and security, many of whom have experienced persecution and torture; battered spouses and their children; and long-term residents of the United States with significant family and community ties who face deportation. Magnificat of Broward, "Handmaids of the Lord," invites you to a breakfast with guest speaker Carline Faublas. Located at Signature Grand, 6900 State Road 84 in Davie. Tickets are $25 and include a hot breakfast. Please register by May 15, 2019. No tickets will be sold at the door. Carline Faublas is a recent widow, mother of 2, a son and daughter, and works as a paralegal in investigations in Pompano Beach. Carline is a parishioner at St. Bernard Catholic Church. As a mother and former caregiver, she previously served and volunteered with St. Bernard Women’s Guild, St. Vincent De Paul, Shalom Ministry, Magnificat of Broward County along with the Life in the Spirit Seminars & Growth. Currently, Carline servers as an Emmaus leader, Extraordinary Eucharistic Minister, intercessor at Glory House of Miami and is actively involved in her parish’s monthly Rosa Mystica healing service. Most of all she loves being a servant of God! These ministries have allowed Carline to gain a new life, not only by the power of the Holy Spirit within her, but it has also activated a love of service for her community. The Archdiocese of Miami will host a job fair for teachers, parish bookkeeper, director of Planned Giving, parish and school receptionists, coordinators of religious education, maintenance and other church and school positions Thursday, June 13, from 10 a.m. to 2 p.m. at Mother of Our Redeemer Catholic School, in the Father Fernando Compaired Center, 8445 N.W. 186 Street, Hialeah, 33015. For more information, please visit our website:www.miamiarch.org/jobpostingsPlease follow the link if you are interested in attending: https://www.surveymonkey.com/r/DV8KGRX. 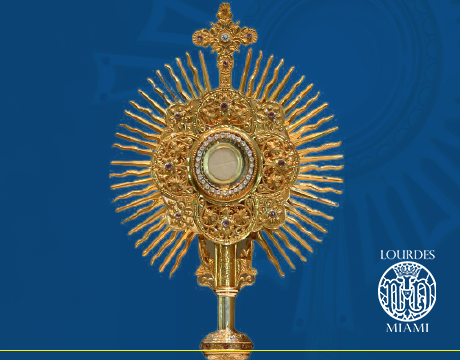 Please join us for an evening of adoration of the Blessed Sacrament in our Eucharistic Procession. Everyone is invited, especially those who are sick and their caretakers. Invite everybody! We are waiting for you! Por favor únase a nosotros a una noche de Adoración del Santísimo Sacramento en nuestra Procesión Eucarística. Todos están invitados, especialmente aquellos que están enfermos y los que los cuidan. ¡Inviten a todos, los esperamos!